It is called 'Buhari Mean Time' in Abuja. It started as a jocular description and then became a warning: President Muhammadu Buhari will not be rushed into decisions, especially when it comes to appointments. The new cabinet has been six months in the making (AC Vol 56 No 20, At last a cabinet, and now for the policies). Yet the naming of a potential 36 ministers, amid insistent demands for factional and regional balancing, was always going to be tortuous for a President and retired General who remains deeply sceptical about partisan politics. On military and civilian matters, Buhari values strategic thinking over tactical coups. Since June, he and his highly effective Vice-President, Yemi Osinbajo, have taken extensive soundings about how to make institutions and officials work better. The new commanding officers and intelligence directors were appointed several months ago, as were the directors and top managers of the main parastatal companies. More recently, the government has named the top management of key institutions such as the Nigeria Customs Administration, the Economic and Financial Crimes Commission (EFCC), and the Nigerian Ports Authority. Although Buhari, closely advised by his Chief of Staff and long-time ally Abba Kyari, has reorganised the senior ranks of the civil service and the state-owned enterprises, he is likely to give the ministers substantial autonomy to manage their portfolios under the new division of labour (AC Vol 56 No 9, APC to lead with a leaner team). 'Set the rules, the goals, and make sure the system works,' was the ethos, according to another insider. Within that system, Buhari is taking the lead on security, anti-corruption and oil industry reform, and Osinbajo heads the economic team. The three key ministers on security matters will be General Abdulrahman Bello Dambazau, Minister of Internal Affairs; Gen. Mohammed Mansur Dan-Ali, Minister of Defence; and Geoffrey Onyeama, Minister of Foreign Affairs, a barrister and previously Deputy Director for Development at the World Intellectual Property Organisation in Geneva, Switzerland. The National Security Advisor, Gen. Mohammad Babagana Monguno, will remain a key figure in shaping strategy both on the Islamist fighters of Boko Haram in the north-east and on rumblings of renewed militancy in the Niger Delta and efforts by pro-Biafran secessionists to push their case in the south-east (AC Vol 56 No 22, The cauldron boils again). In a government where the Delta and the south-east are still under-represented, Onyeama, brother of the celebrated author Dilibe Onyeama, could play an important role outside his main brief on regional and international diplomacy. Back in September, Buhari explained that he would be his own Oil Minister with Emmanuel Kachikwu, who is shortly to leave his post as Group Director of the Nigerian National Petroleum Corporation (NNPC), as his deputy. An Assistant Commissioner of Police and experienced investigator, Ibrahim Mustafa Magu, a Kanuri from Borno State, replaces Ibrahim Lamorde as head of the main anti-corruption agency, the EFCC (AC Vol 56 No 16, Fighting graft, Buhari-style). Both Lamorde and Magu worked closely with London's Metropolitan Police on the prosecution of James Onanefe Ibori, former Governor of Delta State and now in gaol in Britain, for money laundering. Buhari wanted to double, at least, the resources and staffing of the country's anti-corruption agencies, he told Africa Confidential earlier. Before making the ministerial announcements, Osinbajo had been spelling out the government's economic plans, which include a near doubling of this year's US$20 billion federal budget but with the bulk of the new spending directed into development investment. Osinbajo, Kyari and Buhari combined the strategy of economist John Maynard Keynes in their belief that Nigeria must spend and invest its way out of the current recession with the austere rigour of Britain's post-war Finance Minister, Stafford Cripps, with their promised clampdown on wasteful state spending. • Minister of Finance: Kemi Adeosun, former Finance Commissioner for Ogun State and ally of its Governor, Ibikunle Amosun; with experience of investment banking and accountancy in her birthplace, Britain; she will focus on the Treasury and federal allocations. • Budget and National Planning Minister: Udoma Udo Udoma, a veteran lawyer, businessman and former Senator, he will work closely with Osinbajo on strategy and longer-term policy development. • Trade, Industry and Investment: Okechukwu Enyinna Enelamah, the banking star who established African Capital Alliance and built it into the country's biggest private equity company, will work both on economic diplomacy and on rebuilding and widening international commercial links. • Energy, Housing and Works: Babatunde Raji Fashola, the popular former Governor of Lagos State, has been given a super- ministry overseeing some of the government's biggest budgets but also its politically critical power sector reforms. • Solid Minerals: Kayode Fayemi; although tipped for Foreign Affairs or a security job where, as a former assistant Professor of Security Studies at Fort McNair's National Defense University, United States, he has proven expertise, he has a demanding task to fast-track mining development, including in large tracts of the Middle Belt and north, at a time of sluggish commodity prices. If he succeeds, Fayemi could reset the economic balance of power: mineral reserves are estimated to be worth some US$100 billion. • Transport: Rotimi Chibuike Amaechi; the Rivers State ex-Governor takes this big spending ministry at the centre of the government's infrastructure development plans (AC Vol 54 No 16, Amaechi takes on Jonathan). • Agriculture and Rural Development: Audu Innocent Ogbeh; a veteran politician (once Chairman of the previously governing People's Democratic Party) rather than a technocrat, he will rely heavily on the structures and procedures established by his predecessor Akinwumi Adesina, now African Development Bank President. • Environment: Amina Mohammed, a former Special Advisor on post- 2015 Development Planning to the United Nations Secretary General, Ban Ki-moon; this is an astute appointment just weeks ahead of the UN Climate Change Conference in Paris, France. All ministers will face tough constraints, such as sharply lower state revenue and a system of zero-budgeting. Each ministry will be allocated an annual budget for which it must account at the end of the year and which cannot be rolled over to the following year. Foreign travel will be minimised, as will all the ministerial accoutrements and retinues of advisors. 'No one is going to work for Buhari if they want to make money,' joked a communications advisor in Abuja. Capital spending will take priority over recurrent spending, said another official. There will be a relentless focus on agriculture and power, to generate jobs and revenue. None of these strategies is revolutionary: for many years, the previous Economy Minister, Ngozi Okonjo-Iweala, had tried to corral all government departments – including the Department of Petroleum Resources, which was earning up to $100 bn. a year – into depositing all their revenue in the Federation Account at the Central Bank of Nigeria (CBN). Instead, the ministries held myriad accounts with Nigerian, British and US commercial banks which complicated and sometimes obstructed efforts at accountability. At a stroke of the pen, the Buhari government has compelled all ministries to direct all their revenue first to the CBN or else their chief accounting officers will be asked to explain themselves. Such new rules have prompted howls of protest from the country's big banks, whose balance sheets have relied on such state-sponsored largesse. However, it makes much sense for a government that has lost about half of its revenue because of crashing world oil prices. This also reflects a tougher attitude towards government revenue, an attitude which is working its way through to local and international companies in Nigeria. After Abuja recalculated its national income last year, the chronic lack of domestic revenue from tax outside the dominant oil sector became apparent. A massive overhaul of tax assessment and collection is under way: officials say they don't want to raise tax rates, just ensure that individuals and companies obey the law. That may be part of the background to the telecommunications regulator's decision to fine South Africa's MTN mobile telephone company $5.2 billion for failing to disconnect 5 million unregistered SIM (subscriber identity module) cards. To outsiders, the fine seems draconian but so does the $400 million a year that MTN has been transferring in management fees from its Nigerian subsidiary to a tax-free entity in Mauritius. The case follows other fines imposed on First Bank, Skye Bank and Stanbic IBTC Bank for other regulatory infractions, officials say. Nigeria's formerly hyper-profitable banks are in for a much tougher ride under the new Buhari order. Over a trillion naira ($5.02 bn.) has been taken out of the banking system and transferred to government accounts over the past three months. Both the World Bank and Renaissance Capital highlight the effect of Nigeria's stagnant manufacturing output and warn of the impact of its and South Africa's economic woes on trade and investment across Africa. The Bank argues that unreliable electricity supply and the falling output of the oil refineries has dragged down growth. RenCap economist Yvonne Mhango points to the slowdown in the food, beverage, tobacco and textile sectors caused by fuel shortages and fewer dollars to import manufacturing inputs. Standard Chartered Bank economist Razia Khan sees signs of recovery in agriculture. Yet progress across the economy depends on a sustained boost to electricity generation and a revamped transmission network. The N213 bn. fund, managed by the central bank, to help companies operating under the privatised Power Holding Company of Nigeria should help to speed things up (AC Vol 52 No 18, All the President’s businessmen). The Transmission Company of Nigeria, managed but not owned by Canada's Manitoba Hydro International Incorporated, says it needs billions of dollars of investment to meet the target of 10,000 megawatts of power. Some are calling for its immediate privatisation. Domestic power output has recovered to well over 4,000 MW, up from the oldrums of some 3,000 MW or so. This is still paltry for an economy of Nigeria's size and is due to an unreliable gas supply to the power plants. Policy issues such as the price of the gas for the turbines and electric power itself are yet to be resolved. The Nigerian Electricity Regulatory Commission (NERC), headed by Samuel Amadi, now favours higher power tariffs for consumers. Critical to all this are the linkages between the power sector and the oil and gas industry, which is the government's next target for reform. Alongside security and anti-corruption, it is Buhari's main interest, having previously been Oil Minister in the 1970s. Much speculation surrounds the role of his Deputy oil Minister, Kachikwu. Like Amadi in NERC, he is an alumnus of Harvard Law School with extensive corporate experience; his last job was legal advisor to ExxonMobil. Kachikwu has his foes both in the governing All Progressives Congress and the oil industry. The hunt is already on to find his successor as head of the NNPC and his main task now is to steer the much delayed Petroleum Industry Bill through the National Assembly (AC Vol 44 No 20, So, farewell then). Meanwhile, Kachikwu has been busy at the NNPC, presiding over far-reaching and sometimes unpopular management changes, revisions and reallocations of controversial oil swap and oil lifting contracts, and negotiating a $1.2 bn. financing package with a consortium of foreign and domestic banks to support onshore and offshore oil exploration. This last is particularly important, given the lack of investment in the country's oil resources and complaints from the big oil companies about the NNPC's failure to stick to funding commitments. A key element in the oil industry reforms is to raise finance from local and international money markets but that would be impossible unless both the NNPC and private oil companies submitted to a far higher degree of financial scrutiny and auditing rigour than has been the case for the past five decades. Kachikwu's pledge that the NNPC may seek more favourable terms in production-sharing contracts with the big companies has riled executives, who argue that the weak global oil market should prompt Nigeria to offer better incentives. For the government, dealing with its fiscal crisis will take priority over being nice to oil companies. Following its $2 bn. bail-out package for state governments agreed in July, the federal government now wants to raise funds for sharply higher capital budgets to speed up development in the gas and electricity industry, the road and rail network, and agricultural modernisation. Osinbajo's ambitious national regeneration project ounds like a mini-Marshall plan but it requires a tight lid on recurrent spending and far tougher controls on state contracting procedures, which have been the main income source for many local and foreign companies. The government also reckons it can recover as much as N3 trn. from monies stolen from state companies and trade mispricing scams over the past decade. Problematic as the short-term prospects appear to be, Nigerian and foreign economists still talk up the medium-term future of Africa's biggest economy. Whatever their doctrinal differences with the Buhari team, there is a growing respect for the government's more methodical approach to the reigning administrative and financial dysfunction. Citibank economist David Cowan argues that the second phase of the Buhari government, when the new cabinet consolidates, will calm most of the market jitters about delays in appointments and policy responses. Many economists, such as Ecobank's Angus Downie, expect to see signs of a strong economic revival if the government is able to launch its ambitious investment programme. The lack of good growth prospects elsewhere could attract new money into Nigeria if the new team can quickly establish its credibility. Godwin Emefiele, former Managing Director of Zenith Bank and now Governor of the Central Bank of Nigeria, has become a leading practitioner of ‘Buharinomics’. For six months, he has run the much-criticised no-devaluation policy. Now, he is ordering local banks to double their provision for bad loans. Non-performing loans were up 70% in the first six months of this year. Falling oil prices and state earnings, combined with growing foreign exchange risks, account for most of the bad loans. Described by a bank economist as tackling economic woes with one arm behind his back, Emefiele will get some relief thanks to the new economic team under the leadership of Vice-President Yemi Osinbajo. Just as the new ministers start work, the National Bureau of Statistics has announced that growth for the third quarter has slipped to 2.84%, compared with 6.23% a year ago. This is not due just to low oil prices but to a slowdown in the non-oil sectors, in particular, services and agriculture. Yet the price of oil, which provides over 70% of state revenue but less than half of national income, dominates economic planning. The financial firm PricewaterhouseCoopers, whose high-profile ‘audit’ of the finances of the Nigerian National Petroleum Corporation may yet be redone, predicted in May that average oil prices of around US$55 a barrel in 2015 and around $15 per barrel more in 2016, combined with a stable political environment, would be relatively benign for the country. Far more difficult would be a scenario where prices average $45 this year, combined with worsening unrest in the north-east, because of Boko Haram, and in the Niger Delta, and only modest oil price recovery in 2016. Other analysts have warned that oil prices could dip below $30 a barrel. Lagos-based FBN Quest suggested that prices falling towards $20 per barrel could pose a challenge in those banks financing oil operations. Lower oil prices would force a revision in the benchmark oil price for next year’s federal budget: this year’s was based on a benchmark of $53 a barrel. 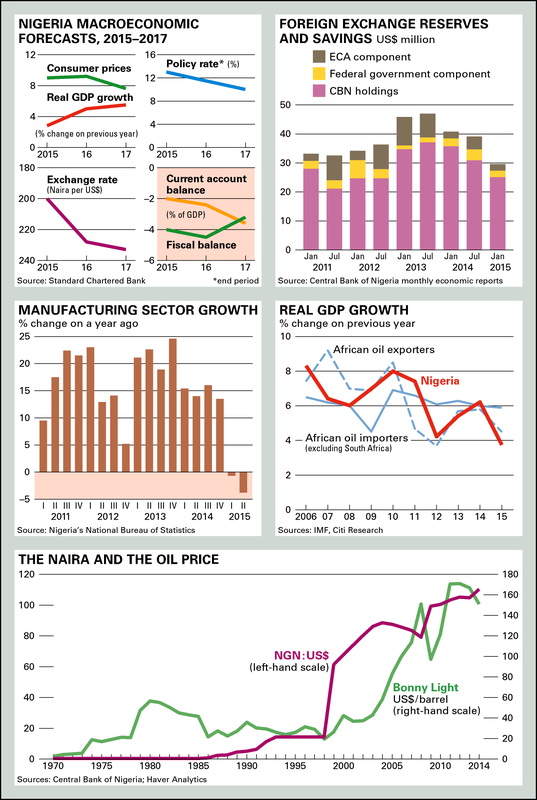 In recent months, bank economists and the World Bank and International Monetary Fund have cut estimates of Nigeria’s growth this year, even if most predict a recovery in 2016-17. While Ecobank and Citibank economists forecast gross domestic product growth at 3.5% and 3.6% respectively, Standard Chartered and Renaissance Capital predict growth of 2.75% and 2.8% respectively. These pessimistic forecasts compare with the 4% now estimated by the IMF and growth of over 6% last year. Prepared for Free Article on 24/04/2019 at 07:28. Authorized users may download, save, and print articles for their own use, but may not further disseminate these articles in their electronic form without express written permission from Africa Confidential / Asempa Limited. Contact subscriptions@africa-confidential.com.